As mentioned earlier, the Ukrainian Independentists, the left wing of the Ukrainian Social Democratic Workers’ Party (led by Vynnychenko and Petliura), stepped forward with Soviet slogans. They formed a separate party during the rebellion against the hetman. Quite of few of them fought Denikin and Sko­ro­pad­sky’s troops in the Red Army ranks. However, the Bolshevik onslaught on Ukraine caused so much bloodshed and exposed their anti-peasantry and anti-Ukrainian nature so readily that most of those who had proclaimed “independent Soviet Ukrainian power” headed anti-Bolshevik up­ri­sings. Symon Petliura rendered an amazingly accurate description of the situation in Ukraine at the time in a letter to D. Antonovych, the head of the Ukrainian diplomatic mission to Italy: “The people, and the peasants above all, have become wild, demoralized, and exhausted. Most of the schools are closed. There is general confusion. Each wants to mind his own business. Lack of the sense of duty. All people care about is their farming plots and produce. This is what most of Ukraine is all about these days. “Peasants are angered by the military, with its requisition teams moving hither and thither and expropriation of horses, so they often rebelled against our forces, forming provincial republics that produce committees, councils, and otamans. Of all the governments Ukrainian peasants have seen and experienced, the Ukrainian one is the closest to his heart, mainly because it has bothered him least of all with requisitions and other forms of government interventions. “Berdychiv. Assault on Cheka. Armory robbed. “Bila Tserkva. Town gripped by revolt. Suppressed by an armored train and a detachment of 300 officers and men. “Vasylkiv. Red Army men plundered the town. “Shpola. Local garrison carries out arrests and searches and beats local residents. “Koziatyn. Red Army men of the 4th Nizhyn Regiment disbanded the Cheka. “Oster. Uprising in vil. Novo-Hlibovo and Svorota. Suppressed by Cheka detachment. Four men killed. “Starodub. Uprising in vil. Vitelyne, suppressed by a regiment of 400; 20 men killed. “Krolivets. Uprising in vil. Antonivka. Suppressed by Cheka detachment. 10 insurgent leaders shot. “Novozybkiv. Uprising in Velyka Topolia, Novo-Robsk, and Lakomo-Buda. Suppressed. Eight casualties sustained by friendly troops. Death toll among insurgents under inquiry. “Pryluky. Uprising in the city and town of Ivannytsi. Suppresed by garrison troops with artillery fire. The underground All-Ukrainian Revolutionary Com­mit­tee was formed in February 1919 to unite the scattered Bolshevik forces. It was headed by Independentist Antin Dra­homyretsky. Yurii Ma­zu­renko was appointed commander of the insurgent troops. He succeeded in bringing under his command former Petliurite units that were then led by Zeleny, Sokolovsky, and Anhel. All their standards bore the Soviet slogans of the Independentists. Most of the insurgent otamans, such as Zeleny, So­ko­lov­sky, Tiutiunnyk, Struk, Lopata, and Lopatkin, took part in an anti-hetman uprising in 1918 and led their units to join the Red Army. Shortly afterward, they became otamans of detachments that fought the Bolshevik onslaught. Attri­buting such metamorphoses to the “ petty bourgeois element” or “anarchist guerilla activities,” as did Ukraine’s People’s Commi­ssar for Military Affairs Mykola Podvoisky, would mean simplifying the issue. These phenomena primarily signified the loss of popular support for the new regime in Ukraine. On May 7, having refused to deploy his division on the Romanian Front, Hryhoriev proclaimed his universal [decree], urging the Ukrainian people to rise in arms across the country against the Bolsheviks to fight “for the power of the Ukrainian people’s Soviets without Communists” and without “communes,” “Moscow commissars,” forced grain procurements, requisitions, and extraordinary committees. Ukrainian Independentists in Otaman Hryhoriev’s combat units had considerable influence. 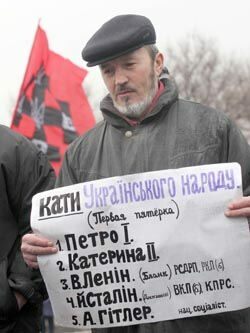 Hryhoriev’s chief of staff was Yurii Tiutiunnyk, one of the noted leaders of the Ukrainian liberation movement. However, the Independentists failed to take the political lead of Hryhoriev’s uprising and it ended in a fiasco. After the Bolshevik-caused bloodbath in Ukraine and the suppression of the largest centers of peasant resistance, the Ukrainian Independentists changed their political course, aiming at rapprochement with the Bolsheviks. They renamed their party as communist, declared their loyalty to the existing government, and at the same time enhanced their national program. The Bolsheviks were always wary of this Ukrainian party; they refused to accept political life as interaction between various forces each of which has the right to exist. They did not see any other political trend, except the Bolshevik one, as being admissible. They fanatically believed that the dictatorship of the proletariat was inevitable; that this was an undisputable law of history, the only one they knew and understood; that they were the sole representatives of the proletariat, even if workers disagreed. This was sheer political arrogance that rested on the monopoly on truth. The Bolsheviks had to use the Borotbists’ influence on the masses when fighting Skoropadsky and Denikin and suppressing peasant revolts. Lenin, however, regarded the Borotbist demand that a Ukrainian army be formed as a breach of the fundamental principles of communism. He accused them of supporting banditry as a tool of counterrevolution and international imperialism. The Borotbists made another attempt to win international recognition in 1919, when they asked the Communist In­ternational to acknowledge their party as a CI section. This was a naive move, considering that the CI was controlled by Lenin’s creatures and was being financed by the Bolshevik government. When the issue was under discussion in the CI, the Borotbist delegate Hrynko thus formulated his party’s stand: “The point in question is the resolutions passed by the central executive committees on the economic and military union between Ukraine and the RSFSR. The Borotbists are for a close political and economic unity and fulfillment of common economic plans of Soviet Russia and Soviet Ukraine. However, the Borotbists’ hopes for understanding were illusory. The debate was held in accordance with the Bolshevik pattern. Grigory Zinoviev, Chair­man of the Comintern, declared that the interests of the world’s proletariat demand that there be only one party in any given country. Rakovsky, who represented the Communist Party of Ukraine, accused the Borotbists of having taken a petty bourgeois and counterrevolutionary stand. “Soviet troops approached Kyiv after occupying all of Left-Bank Ukraine. They were supported by the local residents. These Soviet troops were Ukrainian. Initially, those who had waited for Soviet power to come wanted to take a closer look at it and forgave it a lot. The dictatorship enforced by adventurous outsiders alienated local communist forces while offering nothing positive in return. Then uprisings broke out. Then Soviet authorities burned down entire villages, shot Red Army men of the Tarashcha Division, and the village poor. Then the situation became totally confused and Kyiv’s proletariat (Arsenal) did not give Comrade Trotsky a friendly welcome. “Hungary was suppressed, much to the joy of the world’s counterrevolutionary forces. “Soviet power in Ukraine collapsed. Functionaries left for Turkestan, Siberia, etc. to enforce the regime there. “Yet Soviet power is alive in Ukraine! It will live provided the Communist Party of Russia shows genuine internationalism and will not enforce “Red” imperialism (Russian nationalism) in Ukraine. “If this is the attitude adopted by the leadership, there is nothing unusual about a gang that came to Ukraine from Russia and shot a member of their own party (CPU), a battle-hardened revolutionary held in esteem by the impoverished peasants in the district simply because he voiced his Ukrainian sentiments. (H. Zenkov of Poltava gubernia. Comrade Rudenko, a member of the local CPU group, was shot or, more likely, tortured to death after being condemned by the group’s general meeting and sentenced to death by show of hands, without investigation and trial). “It is not clear what they were after: if it was Soviet rule, then we are all for it, but why fight the poor, why treat working people so rudely, offending and humiliating them?... If they wanted to make Ukraine a colony, this does not conform to the concept of Soviet power as a historical phenomenon... Then what can explain this attitude to the local Communist forces, the sole basis of Soviet Power? “The consequences are horrifying in terms of both scores of unwarranted victims and the overall results of the socialist revolution. I cannot attribute this to malicious intent, yet what was happening was as though Soviet power were governed by experienced Black Hundred men who were preparing a counterrevolution. “You know, watching all the insanity perpetrated in the name of Soviet power in Ukraine, many are convinced that this is a mistake and that the Center does not know the true state of affairs. In particular, many believe in the power of your authority. “Please respond. Much depends on your response. We need to hear the voice of the true revolutionary now more than ever before. At the time when the Borotbists were drawing nearer to the CP(B)U, the anti-Ukrainian propaganda campaign gained scope and momentum. There was every sign that the Russian Bolsheviks would not tolerate any independent move on the part of Ukraine, in any field of endeavor. Pressured, threatened, and enticed by grandiloquent promises, the Borotbists resolved to disband their party at the last conference in 1920 and to merge with the CP(B)U.
Lenin essentially orchestrated the conference from backstage by sending telegrams to Ra­kovsky (C/O Blakytny), Shum­sky, and Stalin. Besides, it is safe to assume that the Cheka closely followed every conference delegate. On March 20, the Fourth Conference of the CP(B)U elected Blakytny and Shumsky members of the Borotbist leadership, establishing a joint Bolshevist-Borotbist committee to admit former Borotbists to the CP(B)U and went through the motions of a party merger, recognizing the Borotbists’ party membership service record since the rift in the Ukrainian Socialist-Re­vo­lu­tio­nary Party (UPSR), i.e., April 1918. On March 24, the Borotbist Central Committee passed a resolution nullifying the Borotbist party and its central committee, instructing all its members to apply for CP(B)U membership. Out of some 5,000 Borotbists nearly 4,000 were admitted to the CP(B)U. “What is left is an addition of beggar-like elements that, in the absence of control from the centers, flowed from the RSFSR to Ukraine in the time of the second Ukrainian Socialist Soviet Republic (USRR); this is what the CP(B)U was made up of in 1918-19. “Consisting of burgher and beggar-like elements and ‘smart fellow travelers,’ it has found itself incapable of controlling the stormy revolutionary process. It has lost contact with the working masses and failed to establish them with the rural proletariat. It has failed to carry out the main tasks of politically destroying the Petliurites and otamans and building a solid base in the countryside by way of class division. Finally, it has started to decompose before our very eyes. This is tellingly evidenced by the growth of the second communist formation, the UKP(B)-Ukrainian Communist Party (Borotbists)-at the expense of the CPU; stopping the latter’s gravitation toward self-liquidation; and finally, by the emergence of a separate organizational current within the CPU, the so-called federalist group. At early stage Ellan-Blakytny perceived a tendency to sabotage proletarian forces in the countryside (under the disguise of a campaign against the Petliurites), crack down on Ukrainian intelligentsia, a possible rival within the government apparat, and at the same time step up coercive, repressive, administrative, and controlling measures. It had become clear by then that admitting Borotbists to the CP(B)U did not mean that the Bolshevik policy in Ukraine would be changed. The Bolsheviks were simply unprepared to accept the idea that Ukrainians had legitimate cultural and national demands. The guerilla movement continued long after the official end of the civil war, while the Basmachi movement was launched in Central Asia. Lenin and his aides decided to formally regulate relations between the Center and the regions by establishing the USSR, which actually meant recognition of every Soviet republic’s defined sphere of competence. Lenin was sick and it was obvious that there would be an inevitable struggle for power, so Rakovsky suddenly sided with Mykola Skrypnyk as the foremost champion of an independent Ukrainian government. The two of them jointly opposed the adoption of any Constitution of the USSR and came up with a bill under which the republics were to receive more rights than those laid down in the official Constitution of 1923. Prior to the 12th Congress of the RCP(B), Stalin published his theses on the national question that were strikingly reminiscent of the draft decree signed by Shumsky in 1919. Skrypnyk addressed the Fourth Congress of the CC RCP(B), which was attended by functionaries from the national republics and oblasts (June 12, 1932), with an account of the tragedy in Berdiansk. He said that the Central Committee of the All-Union Communist Party (Bolsheviks) had dispatched the ex-Borotbist Stepovy to investigate cases of “leftist abuses” on the part of local party cadre in the rural areas. The Chekist Bronsky was accused of having organized a provocation and maintaining contacts with Petliurites. Bronsky was shot by a firing squad. This kind of policy led to large-scale conflicts. The Bolshevik Red Army was forced to retreat from Ukraine, now and then. On October 2, the Ukrainian state disbanded itself and the CC CP(B)U ceased to exist. Denikin was all out to seize Moscow. The Soviet government was on the verge of annihilation. All Bol­shevik forces were deployed to defend the capital city. It was then that Lapchynsky convened a secret congress in Gomel without authorization from the Center and stated his intention to struggle for a completely independent Soviet Uk­raine, using its own military and economic re­sources. He wanted to have a party center that would be independent of Moscow and could independently elect its own leadership. Russia’s Bolsheviks, however, had no use for an independent Ukraine, even if it were governed by its own communist party. One is instantly reminded of Lenin’s admonition that a free Ukraine is possible only when united with the proletariat of Great Russia; otherwise it does not even come into question. In 1919 the Bolsheviks had enough problems to tackle; they needed qualified personnel so much that they even forced former tsarist military experts to go to the front lines under the red banner, while their families were held hostage by the Cheka. Nevertheless, a plenipotentiary delegation was instantly dispatched to Gomel, including Kosior and Manuilsky. The two torpedoed Lapchynsky’s proposal. He wanted Ukraine to be a sovereign Soviet socialist republic with its own Soviet government, with all representative bodies made up of local Soviet Ukrainian authorities. An alliance with any other Soviet republics were to rest on truly federative principles. He opposed subordination of economic spheres to a single Great Russia’s Center. Lapchynsky’s platform was largely supported by the Gomel congress participants. “I was struck by the depth of so-called Soviet Ukrainian patriotism in Volyn, in particular because most of them (Vasyliev, Borysov, and others) were not Ukrainians in that they did not speak Ukrainian; Vasyliev, for one, was an ethnic Russian and his party work prior to the revolution was in Russia. He had started working in Ukraine only a short while ago. In other words, he and I belong to the same crowd. “The [party] people who worked in Volyn had to adopt a cautious, balanced attitude toward Ukrainian political issues because they had to reckon with the Borotbists, a strong political adversary that was rather influential in Volyn. At the time they had high-ranking party functionaries in Zhytomyr because a large part of their Chekists were there, including Comrades Poloz, Shumsky, and Yakovlev, to mention but a few. Obviously, there was a real opportunity for the Ukrainian pro-communist parties to build a solid party center that would be independent of Moscow. At the time, the Borotbists were a rather influential party. Neither the Central Rada, nor the Directory or the Hetman government proved capable of resolving social and political problems — and all these administrations turned out to be unprepared in military terms. Most people realized that they were past the point of no return. Quite a number of Ukrainians found themselves inclined to accept the communist regime. It promised to distribute land to peasants and solve other urgent problems, while being independent of Moscow. Gomel offered a real opportunity for uniting the scattered forces of the Ukrainian revolution. There was a historical fact that looked paradoxical at first sight and yet had a deep logical cause: Lenin and his milieu were able to put up with the German occupation of Ukraine but refused to tolerate an independent Ukraine with its socialist revolution slogans and its own path of progress. Moscow sent a telegram c/o Zatonsky and Kosior instructing them to disband the congress forthwith. When this turned out to be impossible, the All-Ukrainian Re­vo­lu­tionary Committee was set up in Moscow (consisting of Rakovsky, Manuilsky, Zatonsky, Kachynsky, and Hrynko) and this decision rendered the resolutions of the Gomel Congress legally void. At the same time Lenin signed a decree setting up a mobile party center tasked with supervising party work in Ukraine. Lenin thus blocked the activities of the Ukrainian national communists, but there was also the mounting threat of a social outburst in Ukraine guided by anti-Bolshevik slogans. This could be headed precisely by national communists owing to their influence and authority. The Bolsheviks could not ignore this danger. It was then the Jesuitical character of Lenin’s policy manifested itself in full measure. The Moscow Center set the goal of disrupting the organizations of the Borotbists, Bor’ba, and UKP. The leaders of the Ukrainian national communists were under pressure to switch over to the Bolsheviks. At the same time, an active campaign was launched against the Ukrainian communists who supported the idea of Ukraine’s independence of Russia.